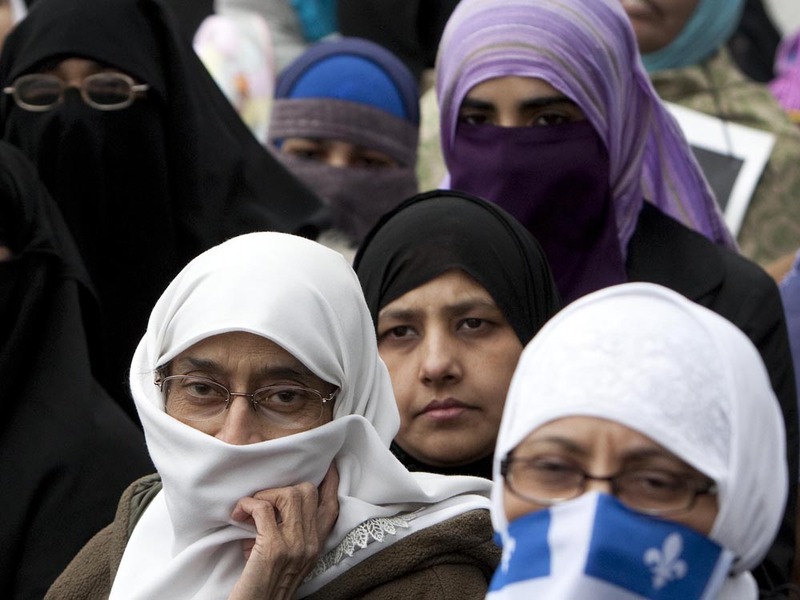 Quebec women attend a protest in 2010. As was widely anticipated, Quebec’s Bill 62, banning face cover in the realm of public services, will be legally contested: by an individual niqab-wearing woman, supported by the CCLA and the National Council of Canadian Muslims. Prime Minister Justin Trudeau is considering how his government too may “weigh in” on the challenge. Amongst the (anglophone) chattering classes a consensus has formed that the challengers will win on constitutional grounds, in that women have a Charter right to dress as conscience dictates. For example, to some individual southerners the Confederate flag may represent nostalgia for mint juleps on the porch at sunset, but rightly read, that flag represents America’s shameful record on slavery. Likewise, some niqabi women believe they are merely expressing “modesty,” but rightly read, the niqab represents a fundamentalist strain of Islam’s oppression of women. That there are relatively few niqabs in Canada is neither here nor there as a matter of principle. It seems to me strange and hypocritical that we see no problem in repressing even infrequent messaging associated with racism. But, fearful of being perceived as Islamophobic, we won’t endorse action against messaging that emblemizes gender apartheid. Elsewhere, in countries mugged by reality, as dramatically changing demographics threaten established assumptions about democracy, religion and gender equality, a more honest public discussion is taking place. In fact, while we are needlessly guilt-ridden by statistically modest rates of Islamophobia, European countries are struggling with a statistically troubling and socially consequential rate of “Occidentophobia” (hatred of the West). Koopmans then asked his respondents, both strong believers and fundamentalists, to respond to three further questions: “I don’t want to have homosexuals as friends”; “Jews cannot be trusted”; “Muslims aim to destroy Western cultures” (for Christians); and “Western countries aim to destroy Islam” (for Muslims). He found that nine per cent of all Christians are overtly anti-Semitic, 11 per cent reject homosexuals, and 23 per cent believe Muslims aim to destroy Western culture. But only 1.6 per cent of Christian respondents were hostile to all three groups. Amongst Muslim respondents, 57 per cent were hostile to homosexuals, 45 per cent were hostile to Jews, and 54 per cent felt the West was inimical to Islam. Not all fundamentalist Muslim women wear niqabs, but all who wear niqabs signal support for fundamentalism. Bill 62 may not change their minds, but it sends the important message — one that may resonate with the daughters of Quebec’s niqab-wearing women — that pluralism, gender equality and social reciprocity are pillars of our culture’s “core identity” (yes, prime minister, we do have one). The higher value of “social cohesion” has twice guided rulings against challenges to niqab bans by the European Court of Human Rights, which noted that the religious duty for women to cover was “hard to reconcile” with the principle of gender equality. Let us hope that our judiciary agrees and rules accordingly.